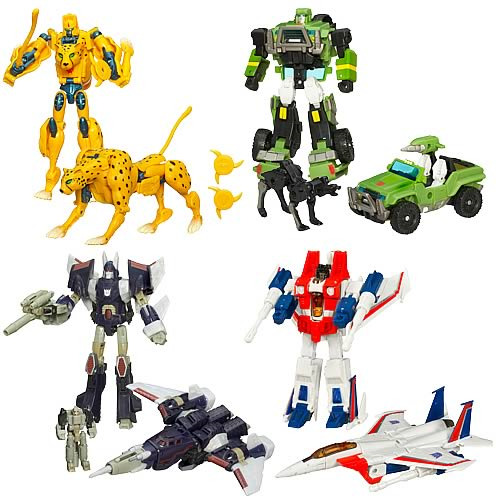 Deluxe figures from the Transformers universe! Cybertron warriors that change from robot to vehicle and back again. Hard-to-believe disguises and super-cool weaponry. Bring some fun and excitement into your life! Flaunting hard-to-believe disguises and super-cool weaponry, the Decepticons and Autobots have arrived from Cybertron in these Transformers Universe Deluxe Figures. They're ready to bring fun and excitement into your life! And true to form, these large, colorful figures morph from robot to vehicle and back again. You'll want them all in your assembly of otherworldly warriors! Transform your collection today by adding these guys to the mix!